More than 140 years ago Louis Pasteur showed the world that the growth of microorganisms was responsible for the spoilage of beverages such as milk, and that heating could markedly reduce such spoilage and resulting illness. Since then, we’ve taken major steps forward to make our food safer, including wide use of pasteurization and safety standards. Over the years, these measures have helped protect the public from countless cases of sickness and have likely saved many lives. While not all foodborne disease has been eliminated, there is no doubt that many, many illnesses are prevented by our current protections. It takes several steps to get food from the farm or fishery to the dining table. We call these steps the food production chain. Contamination can occur at any point along the chain—during production, processing, distribution, or preparation. 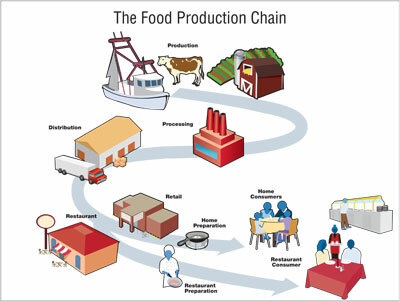 The Food Production Chain. Click the image to get a larger view. Production means growing the plants we harvest or raising the animals we use for food. Most food comes from domesticated animals and plants, and their production occurs on farms or ranches. Some foods are caught or harvested from the wild, such as some fish, mushrooms, and game. The ultimate goal for public health is not just stopping outbreaks once they occur, but preventing them from happening in the first place. The long-term result of outbreak investigations and additional research should be improved practices in industry, stronger regulations and enforcement by U.S. regulatory agencies, and better consumer understanding, all of which should reduce the number of foodborne illnesses that occur. If you feel you became ill after eating at a Wyoming food establishment or after purchasing food from a Wyoming establishment, please click the link below and complete the complaint form. Reporting illnesses to your local health department helps them identify potential foodborne disease outbreaks. Public health officials learn about possible problems in food preparation, production, and distribution that may cause illness during investigations of foodborne disease outbreaks. Please call CDC INFO at 1-800-CDC-INFO (1-800-232-4636).